Enough with the black and pin stripe suits! Gangsters have been drab for far too long. 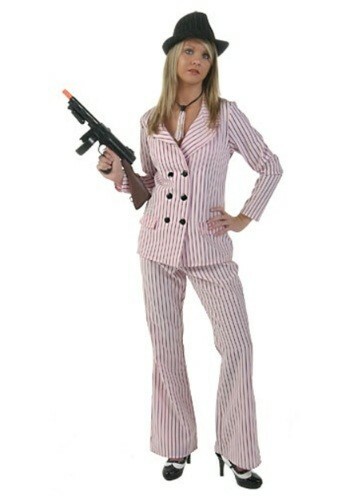 Add some color into the mix by going in a Plus Size Pink Gangster Moll Costume! It's pink, but it's all business. Gangsters always had great style, but they never really diversified their fabrics. Every single suit in Capone's closet? Plain black or pin stripes on black. Hanger after hanger, the same thing. The gangster style definitely needs a feminine touch--a splash of color and flair! That's where our pink gangster costume comes in. Show all those gangsters that you can wear pink and still be a success!